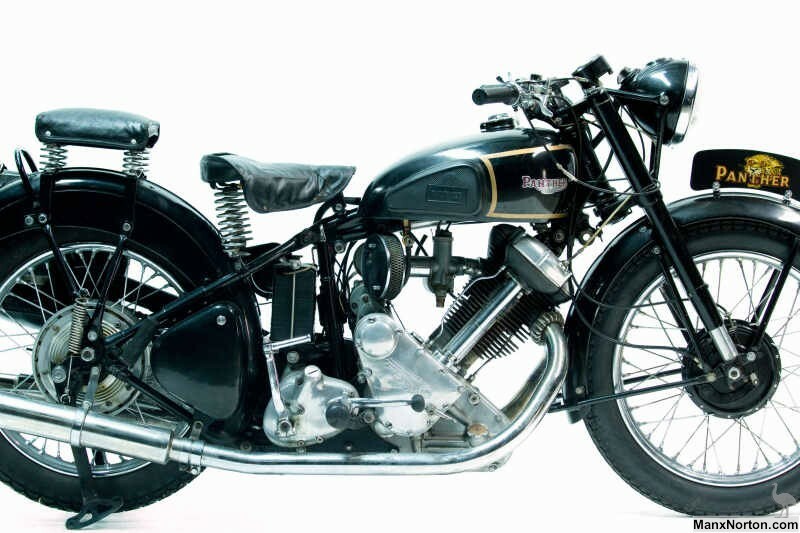 In 1932, the Panther Model 100, an OHV 600cc single, was launched. This heavyweight single ‘sloper’ was the epitome of the big British banger ‘firing once every lamp post’. Promoted as ‘The Perfected Motorcycle’, it was noted for innovation for most of its history. However, this reference had a touch of irony by 1950 when the marque reintroduced the manual advance/retard. Putting this Britishism aside, the Panther 100 remains an awfully handsome and torque-soaked machine. Its build quality remained a benchmark for decades and its simple and fairly robust powerplant continues to inspire enormous enthusiasm in its owners. These factors, combined with relatively low cost, make the Panther a rare and desirable classic. This example comes from a long-term South Island collection and has been well maintained over the years.